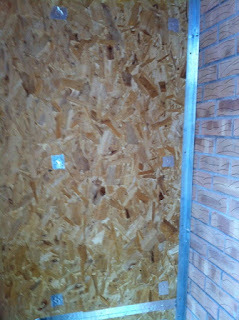 19 Sept 2012: [Extension] The opening in the brick wall needs lining, as we have Ken and Adam returning to screed the floor on Friday. The screed needs 300 litres of sand+cement so this has been ordered. 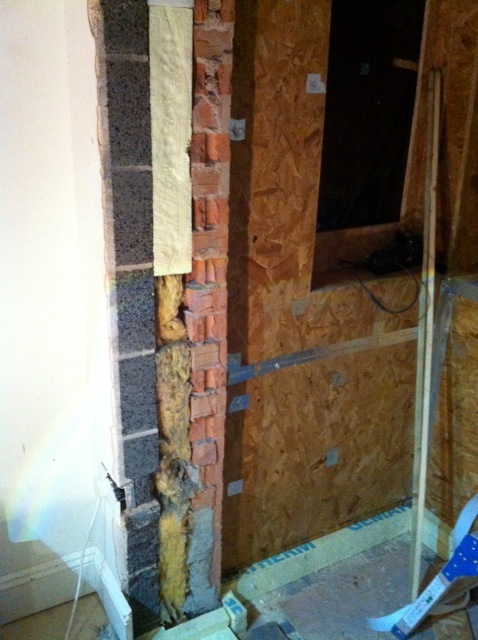 Also, the brick walls in the extension will be a thermal bridge to the outside, so they will have to be coated with thermalboard. 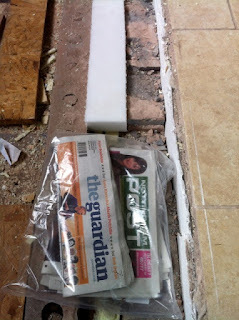 As the jamb in the cavity wall is being closed up, it occurred to me (looking at our full paper bin) to put some of the contents into a plastic bag and hide them in the cavity for future generations. Yesterday's Guardian might not be of interest to us, but it will be of great interest in a hundred years time. A document about the house, such as a paper about the solar panels would be good too. Another task is to seal every nylon bolt with vapour proof metal tape. Although the nuts are done up tightly, there could be an air passage along the rod-hole which needs to be closed on both sides. 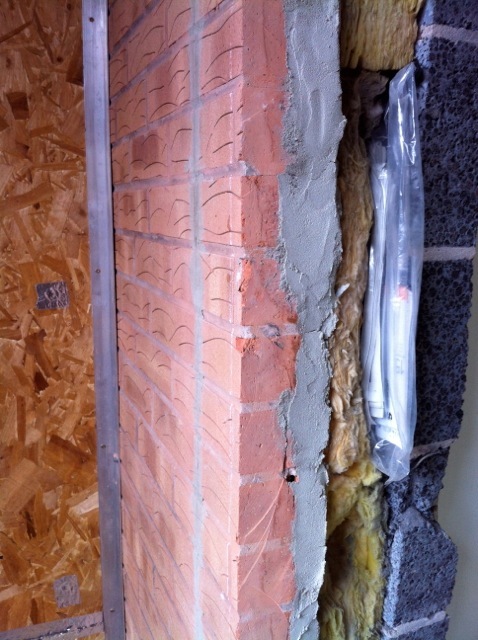 The screed will go over this cavity wall and must not connect with the brickwork or there will be a thermal bridge, so this compressible foam is pushed into the cavity. 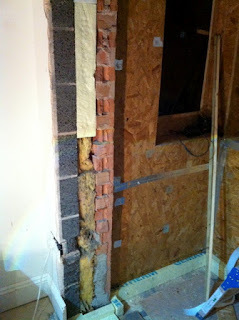 Maybe the house will be demolished in 100 years time, or later, who knows? 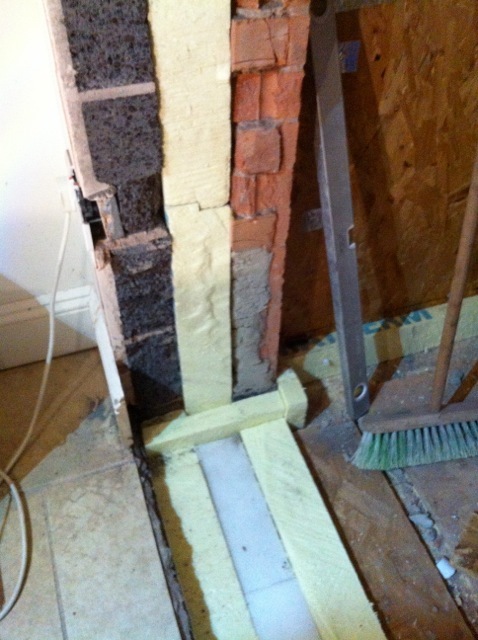 :( Hope not… but let's leave a time capsule in the cavity. Some Guardians, Nottingham Post, a fashion catalogue, a letter with our address, an electronics catalogue. The Time Capsule will go at eye level in the jamb of the opening, more likely to be found if the house is demolished. I might think of more things to put in before it is totally sealed. A MacUser magazine, something about the Olympics, my paper for SET Vancouver and more. 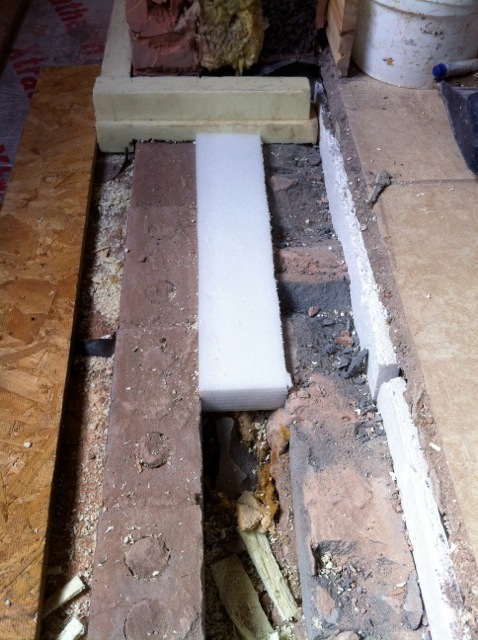 Extruded polystyrene is being cut into slices and chamfered so that it can be pushed firmly into the cavity. This will be plastered over. End of the evening, and the cavity is filled, and the cavity under the screed is also completely insulated.